Our mind becomes almost very restless when we have an important project to be completed within the next few hours and our Oracle DB gets locked due to attempting maximum number of incorrect password hits. CHOICE 1: Wait till the LOCK_TIME is complete and then try the next maximum attempts. CHOICE 2: Send a mail to the DB Administrator and wait till the Administrator Unlocks the account. Before following the below steps, please confirm that, you have logged into your Windows OS as an Administrator. 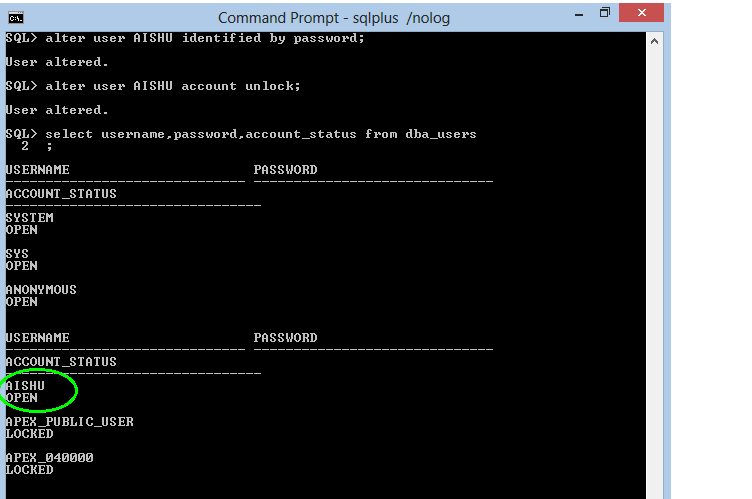 This command helps you to log into the sqlPlus Editor. This command helps you to connect to the SQL Server as Database Administrator. Here SYSDBA is the ROLEName. Now you are the ADMINISTRATOR. So, you can control your SQL Server, which means you can control your DB Account even. 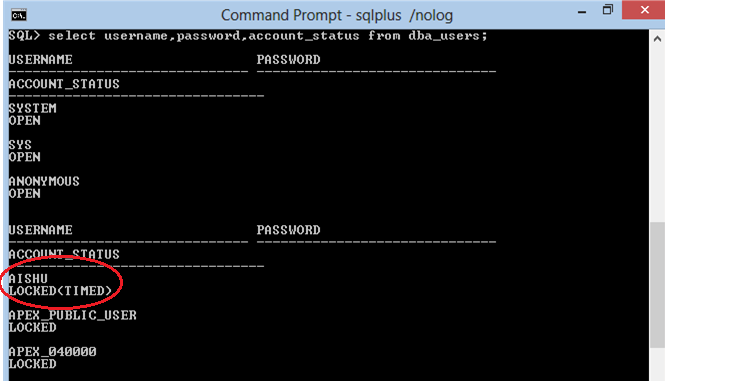 This command retrieves the UserName , Password and Account status of all the accounts in your SQL Server. You will also find your Oracle DB name that is “LOCKED” and the LOCK that is TIMED. You can check if your account has been unlocked by typing the command as in “STEP 5″. The Result should be as below. Step 8: Now Open your SQL Developer. Right Click on your DB Name. Set your DBName,UserName Password. Configure the rest of the settings. Click on Test. If the Test proves SUCCESS, Click on Save . Click on Connect to connect to your database. Hope you are happy in unlocking your account.